There’s no doubt about it: Phaedra Parks is the absolute queen of throwing shade. In all honesty, she should just change her name to Shadera. She has the most hilarious and witty insults on Real Housewives of Atlanta. She makes me laugh every time, but I would never ever want to be on her bad side. That woman can throw down. That is why we should honor her on her birthday by going through some of her best insults and shade throughout the years. Honestly, there are too many to choose from and yes, for the most part they are all aimed at Kenya Moore. Sorry, girl. Nevertheless, Phaedra makes great TV and is constantly quotable. Pretty much everything Phaedra says is GIF-material, so check out these great moments that she has blessed us all with over the years. She has a point though, doesn’t she? If people are really focused on achieving success, then it shouldn’t matter what others are doing. “She by Sheree” is a pretty legendary concept. I have no idea if Sheree Whitfield’s clothing line actually exists, but I love hearing those words and any spoof on them. Well said, Phaedra. These days, Phaedra and Porsha Williams are besties, but before that they were shading each other left and right. This line will never get old to me. Porsha has a lot of things going for her, but a knowledge of history is not one of those things. To put it mildly. I don’t think I’ve ever seen these ladies abstain from alcohol at social functions, so it made sense that Phaedra corrected her remark with some shade – much more realistic this way. The show may have “Real Housewives” in the title, but Kenya has never been married and Phaedra has never let her forget that fact. She really wants to drive this point home. This list is really starting to look like a compilation of insults against Kenya, but unfortunately for her, those remarks were some of Phaedra’s best material. Sure, “we’re done” is not a witty insult by any means, but the image of Phaedra sipping on that tea cup was just too delectable not to include. Phaedra attempted to poke fun at Cynthia Bailey’s modeling career by saying that she models for a plus size magazine – which actually shouldn’t be an insult, but that’s what she was going for with this one. So I guess Phaedra made some improvements by stopping with the “whore” talk, but referring to Kenya as Satan isn’t really nice either. Baby steps, right? There isn’t a good justification for referring to someone as a “whore,” but Phaedra attempted to defend her own actions by mentioning the Bible. It didn’t work, but her attempt was pretty comical. Shadera has blessed us Real Housewives of Atlanta viewers with some gems over the years and it seems like she has a wit that gets sharper with age, so I’m sure that this new year will bring even more shady moments. 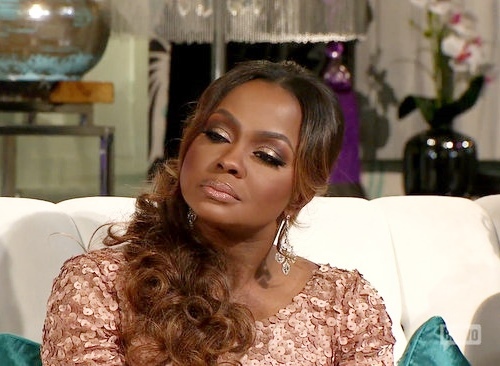 TELL US – WHAT’S YOUR FAVORITE SHADY REMARK FROM PHAEDRA? Will We See Cynthia Bailey Dating Again On Real Housewives of Atlanta?